The familiar shuffling of ice-packs and aroma of hard-work are back. The Morningside Mustangs wrestling team has high hopes for the upcoming 2013-2014 season. The lone returning All-American is 184 pounder Joe Sievert, brother of 2013 National Champion John Sievert. Both decorated high school athletes, the Sievert brothers joined forces on the mat at Morningside under former Mustang head coach Tim Jager, and John was able to bring home the gold last year. Joe described his excitement for the upcoming season in typical Sievert fashion; “I saw what my brother did last year. I want that. I want a national title.” The mustangs’ roster boasts an impressive total of 10 returning National Qualifiers, Sievert included. Of those qualifiers, five are in their final year in the program. Aside from Sievert, the other four seniors: Jordan Langley, Kevin Olson, Harrison Johnson, and Tyler Kacmarynski, are all looking to find their place on the podium. Kacmarynski, a native of Spencer, Iowa, is looking forward to his final year after back-to-back disappointing season riddled with injury. His goals are no secret. He’s incredibly open about his final season. “All-American. National Championship. I’ve been through this before, and I’ve worked harder than anyone else. One goal; one dream.” Kacmarynski currently sits at 12th on the all-time wins list in Morningside history, with a total of 73. Still a little over a month away from the first live action, the excitement is growing amongst the team, as their off-season lifting program increases its intensity. 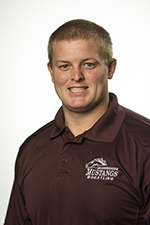 Since the hiring of new strength and conditioning coach, Chad Traver, many Mustangs feel they have really seen positive results. “I just really feel like I get better every time I go in,” junior 141 pounder Nate Taylor noted. “Its been an adjustment, but I can definitely tell that he knows what he’s doing, and I know it’s going to make a difference once the season starts.” The Mustangs have been lifting 3 times a week, with additional cardio workouts twice a week. With practice still a couple weeks away, the team is continuing preparation, beginning to cut their weight, and trying to maintain focus on academics with the upcoming season looming. Looking at the season ahead, there are several possible candidates to join Sievert on the podium. Joining Sievert (84) and Kacmarynski (73) on the top 50 career wins list are returning senior Jordan Langley (49), junior Garret Lambrecht (40), and senior Harrison Johnson (38). Head Coach, Jake Stevenson, still sits a top the career wins list with a total of 130. As the most decorated wrestler in Morningside history in his four years from 2004 to 2008, he also owns the records for 3-point near falls (28), technical falls (7), and victories in a season (45). The Mustangs take to the mat in a mere couple weeks to begin practice, and with Stevenson leading the charge, the future looks bright for this group of grapplers.